“You are dangerous.” These words were prayed over me at a training conference for college students in the summer of 2013. I was at a women’s session. I sat in the back and looked at all the beautiful and holy women in the room and felt I had no place there. I poured my heart, or rather my insecurities, out onto my journal pages. Lines upon lines of frustrations with all the ways I felt ‘not enough’. A friend praying next to me saw my tears and frustration and encouraged me to go to a prayer station. I didn’t want to, but she kept pushing, so I went. When I heard the words, “You are dangerous”, I knew they referred to my daughterhood - to how I could be a warrior for Christ and His Kingdom. When I sat back down, I crossed out everything I had written into my journal. I scribbled over my self- deprecating words again and again with one word: lies. Lies, lies, lies. The Truth had been spoken, and what a relief it was to my aching heart. We, as women, are dangerous to the kingdom of this world, the strongholds and principalities of the enemy. Who we are in the Lord is dangerous because when we know the Truth of our identity, God can do marvelous things to advance His Kingdom through us. I have been praying to know this Truth more deeply and I pray you come to believe it, too. Your identity is dangerous. The way you love is dangerous. The way you pray is dangerous. You threaten any darkness in this world because the glory of God is in you. In the fight to advance God’s Kingdom, in the battle for souls, you are needed. Anything that tells you otherwise is Satan lying to you - YOU are a danger to his schemes. Quite simply, a woman who knows who she is and loves as only she can, has the ability to topple the walls around people’s hearts. At this point, I am a couple years out of college and now working with college students. Sharing this message with the women I work with has become so important to me, because I see it in them. They are strong, loving, passionate, tender- hearted, fierce, and dangerous women and I want them to know it like I know it - as Truth. Being a woman is powerful. In the face of our strength and dignity as Daughters of God, the enemy can only shrink and flee. 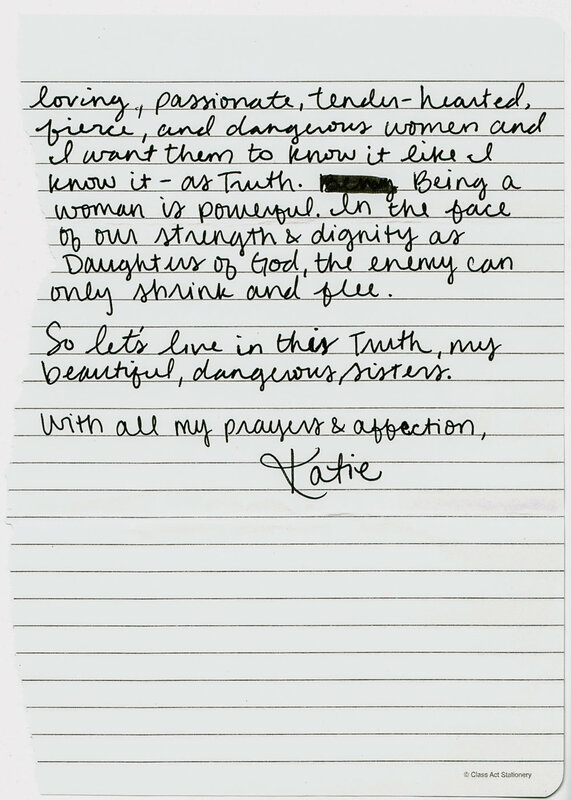 So let’s live in this Truth, my beautiful, dangerous sisters. Hello! My name is Katie Hollcraft. I am 25 years old and a California girl currently living in Boston, MA. I am a missionary with Saint Paul’s Outreach (SPO), an organization on mission to build communities that form college students to be lifelong, faithful Catholics. SPO is on sixteen campuses; I have the privilege of working on Northeastern University’s campus. I am getting ready to go into year two with this incredible organization, and I am so excited to continue outreaching and bringing Christ to college students. I love exploring where I live, long walks, writing poetry, and coffee dates with friends.